With spring under way, artists in Brandon are already at work behind the scenes preparing for an invigorating season. Working up to Open Studio Weekend (OSW, May 28-29), two popular artists – Robin Kent and Warren Kimble – are sharing a studio and ideas as they create oversized paintings on canvas, intended for exhibit during Memorial Day weekend. Engendering the excitement is the news that eighteen OSW sites, including individual artist studios, are located within Brandon this year – more participants than ever before. As usual, the Vermont Crafts Council (VCC) will publish statewide maps showing the sites open for art lovers. The current Kent/Kimble workspace is at he Granary, where during OSW four other artists will present their art as well, explaining their work processes to visitors, perhaps demonstrating techniques. 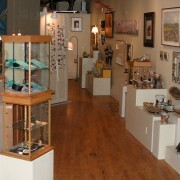 The Bagette, an annex of the Brandon Artists Guild (the BAG), is at the Granary Building on Union Street. The BAG is always the designated “hub” for distribution of statewide OSW maps, so the lucky visitor to town on Memorial Day weekend starts by viewing the art of 45 to 50 artist members of this nonprofit organization. More specific local maps are distributed as well at the BAG, 7 Center Street, next to Café Provence restaurant. The artwork of 12 other OSW artists will be within walking distance of the Center Street BAG venue, along with three other venues within a few miles from town center, namely Fran Bull’s Gallery in-the-Field, Jill Listzwan’s studio, and the Compass Music and Arts Center.